1) Nothing can cast a shadow unless light first falls upon it. is cast upon Jupiter’s surface as shown. But whose shadow is it? It cannot be Europa’s shadow since, by the first principle, nothing can cast a shadow unless light first falls upon it, but no light falls upon Europa, being shielded completely by Callisto. 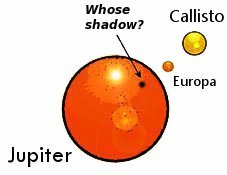 Nor can it be Callisto’s shadow since, by the second principle, Callisto’s shadow cannot be cast through Europa and land on Jupiter’s surface. From Bas van Fraasen’s Laws and Symmetry.